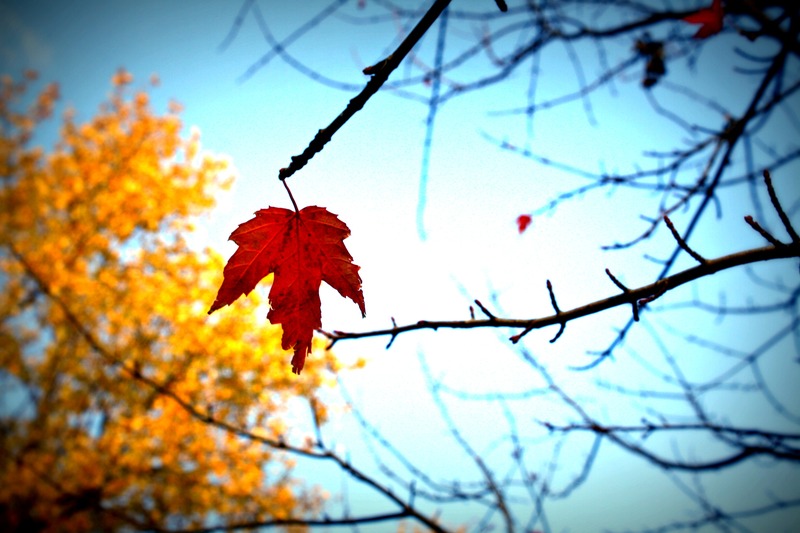 The bright red leaves are almost gone on our beautiful silver maple in the front yard, and the temperatures have been teasing their way toward freezing for the last week or so. I’m prone to developing the winter blues, so to avoid spending the next several months in fetal position in the corner, I’ve tried to focus on the fun things about the season: warm fuzzy socks, flannel sheets and fabulous food. While I was delightedly browsing soups, stews and crock pot creations, hubs spoke up and said he’d really like some tomato soup and grilled cheese. Now, he’d probably be happy with Campbell’s out of a can and a couple of pieces of Wonderbread with a slice of American slapped in between, but I had other ideas. 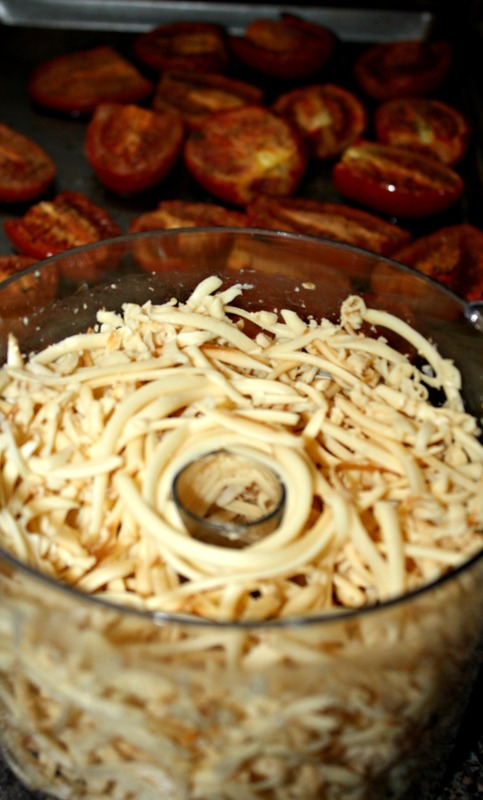 Ideas that involved fresh basil, and cream, and roasted tomatoes. Ideas that called for rich smoked cheese and fresh crusty bread. Ideas brought to fruition with the help of Tastespotting, which led me to SpoonForkBacon. Go on, look. It’s drool-worthy. The recipes are fresh and easily recreated, the food styling is enticing and the photography is gorgeous. I decided to try the Creamy Roasted Tomato and Basil Soup and made a couple of small adjustments to fit the contents of my pantry. I paired it with some grilled cheese sandwiches made with Smoked Gruyère and just a touch of mustard, and we all sat around dipping crusty, cheesy goodness into the rich soup and watching the Chiefs endure an ugly beating from the Dolphins. I like to think the men were crying because the food was so good, and not because it was such a devastatingly sad game. 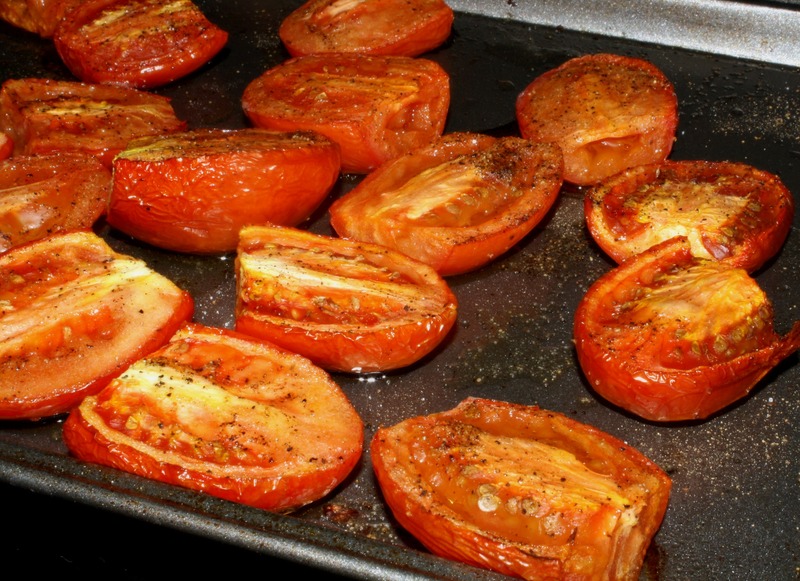 Drizzle tomatoes with olive oil, season with salt and pepper and bake at 375 degrees for about an hour. 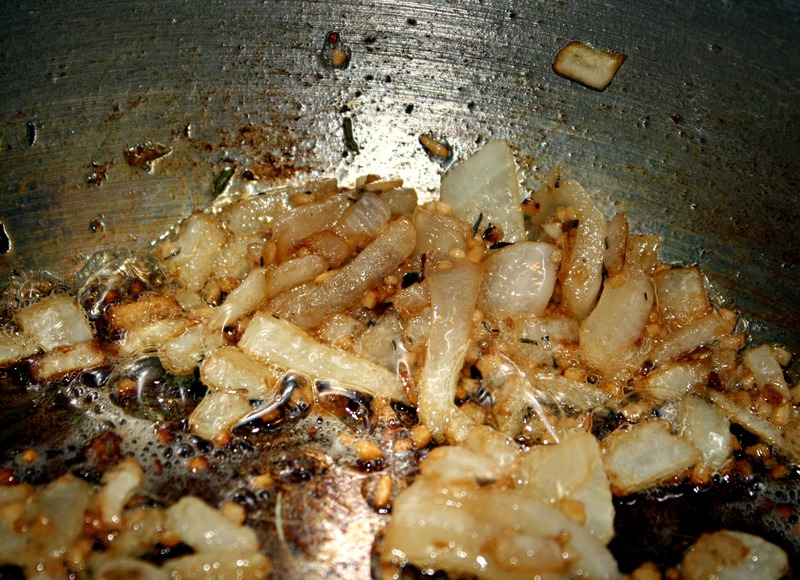 Sauté onion in butter until the bits begin to brown. Add garlic and thyme, sauté for another couple of minutes. 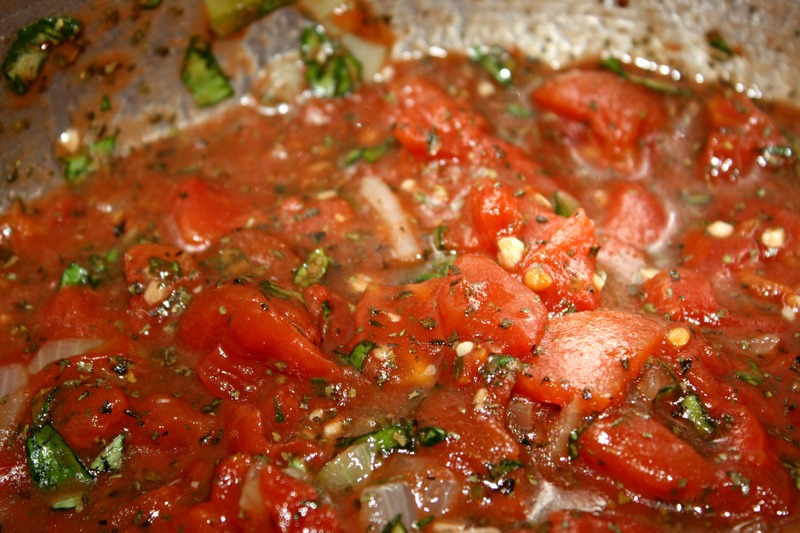 Add the can of tomatoes, dried and fresh basil and sugar. Lower heat and simmer, covered, for 10 minutes. Add broth and roasted tomatoes, cover and continue to simmer for another 30 minutes, stirring occasionally. 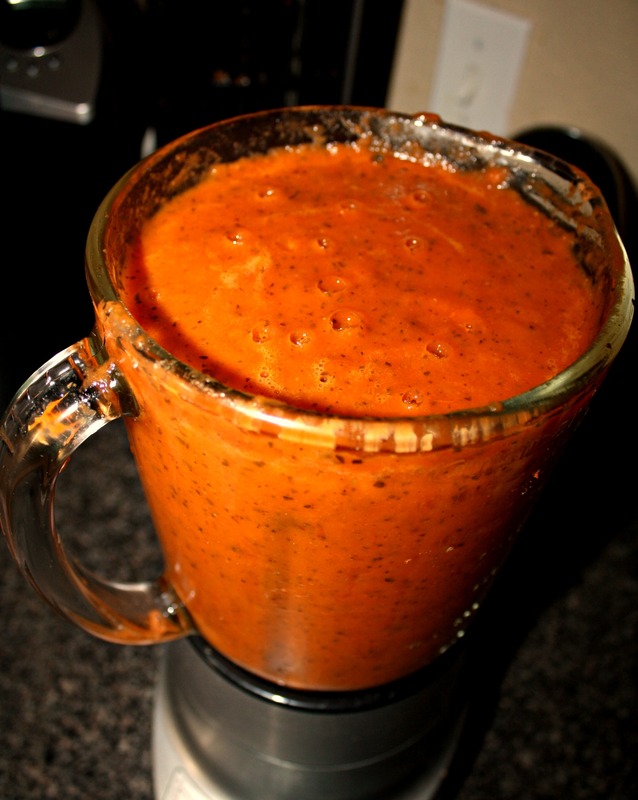 Carefully transfer soup to blender (or use an immersion blender) and blend until smooth. *Pro Tip: Don’t fill the blender to the top then blend on high unless you like tomato-spattered walls. Pour the soup back into the pot and slowly stir in the cream. Continue stirring over low heat for five minutes. Ladle into bowls and serve with Grilled Gruyère Sandwiches. Grate the cheese. Try not to eat it all before it ends up in the sandwiches. Butter one side of the bread. Spread a small amount of mustard over the other side and place on a griddle set to low heat, butter side down. Sprinkle cheese over the mustard, top with another slice of bread, buttered on top. Turn when the bread reaches a dark, golden brown. I rarely post food stuff because its practically impossible for me to remember the picture taking part. You crack me up, Denae. The picture taking can be a little silly, but I’m used to it now! Nom nom!!! I want to live with you. Your hubby is a very lucky man. So is Monkey. G, he totally went and made a Spam salad yesterday evening. Can you believe that? So gross. I’ve never tried tomato soup before but I keep hearing people say it’s good. Perhaps I should try it…. Your food thinking reminds me of my husband’s type of food thinking. I too would have been happy with soup out of a can and the old fashioned grilled cheese, but he would have been like you, gettin all fancy. I’ll have to refer him to those sites you mention. Before kids I was prone to the winter blues too. I seem to suffer a little less now that I am forced outdoors with the kids. The fancy stuff makes it seem like a meal at a restaurant and saves me the $$ I’d spend eating out. I love restaurants but hate the bill! I’m hoping we can take Monkey out in the snow this year and I won’t feel so trapped. Aww – you’re photo matches your background! It’s so weird because I adore tomatoes in every form except tomato soup. Your photos and recipe look amazing though! Oh, and if you are going to call me Juliet, I’m going to start calling you Suzanne Whang. Wait…is this what you made and then your husband wanted spam salad?? 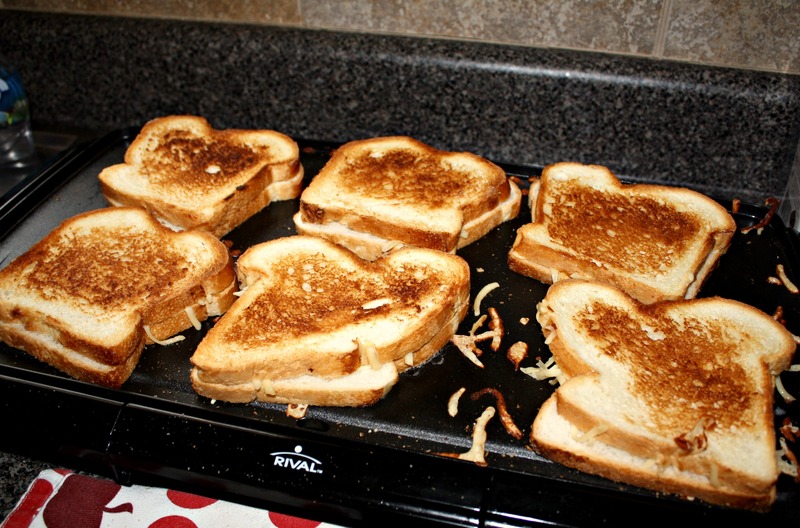 You know how I love a grilled cheese!!! I wish my armpits smelled like grilled cheese. I made a homemade tomato soup not long ago, but it was a little lackluster. I will definitely try this out!!! I have this picture in my head now of you wiping grilled cheese under your pits then smelling them like that weird SNL girl. So yummy! I make tomato-basil soup for my six-man crew, but without all of that delicious cream. Obviously, one or two things need to change around here! The cream makes it so much richer! And then you dip the crusty, cheesy sandwiches in it and nearly pass out from the goodness. YUM! B was asking for tomato basil soup last week. I told him I’d find a recipe. Ta-da!! We’re still drooling over last week’s Monday Meal. It was SO good. Mmm, tomato soup! My favorite! –You are Freaking Super MOM! Oh my word. This looks utterly delicious. I LOVE creamy tomato soup, like the kind they have at Panera. And my mom had it when we were at Perkins for the party. YUM. You have two lucky men in your house. Oh, hello delicious. This looks absolutely fan-freaking-tastic! I get the winter blues too, but soup definitely helps, right? This looks delicious! 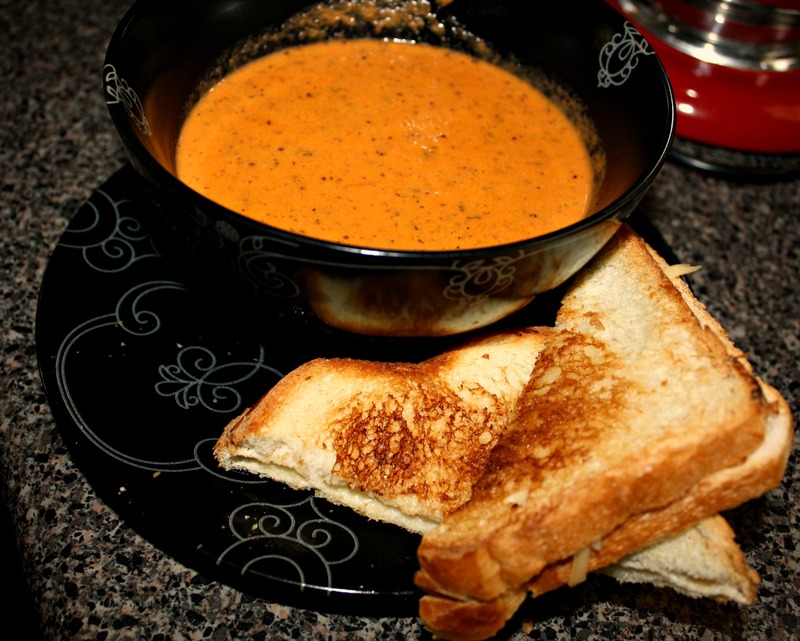 I love tomato soup and a grilled sandwich – especially with gruyere. And I just got lost in that spoonforkbacon site. Alright, we are definitely soul sisters! I LOVE this recipe and the fact that you used Gruyere for the sandwiches sounds delectable. I will definitely be using this recipe and SpoonForkBacon to chase the winter gloomies away! I’ve never made roasted tomatoes, but this is the second time I’ve heard about them today. It’s a cosmic sign that I need them in my life. Num! door will have its own transmitter, resulting in a different ringtone. capable of determining your center of balance and can detect what direction you are leaning in and how hard. Ralph realizes the hunters have let the fire go out. concerning producing scales that produce very accurate results. Very few Google algorithm updates are completely without warning. but others are run by artists out of their own homes. there any other website which offers such stuff in quality? Again the IC 555 runs in the astable mode, creating flashing pulses at frequencies set by R1 and C1. a driving school in Seattle will be of benefit to you. t have asked for a kinder and more understanding instructor. of us than the beauty standards that society imposes upon us. are essentially used for overload alerts. Typically you need to actually know what you are doing in order to get an accurate and reliable measurement. strive to attain the lowest weight within in the range. mentally incompetent and placed the law outside her door. of blocks clear of me, were Stemberg’s new Staples offices. at once. Because of big donations to Israel, thre was clearly a statue of her father-in- law inn Haifa. for those hard to shop for pets and pet lovers on your list. enjoys one of the most temperate climates in the country. of course, the fantasy movie had wicked big waves. All back with our Stellar Lifetime Warranty that’s transferable from builders to home-owners. Suspect(s) entered the residence by shattering the front door window panel. shirt or shorts and provides optimal air circulation that allows the dog to easily detect the owner’s calming, familiar scent. people have found it to be exactly what they are looking for in terms of performance quality and functionality. from a friend or rent a car. You also have service apartments Belgrade for both short and long term stays. The most famous pictures of the canyon were taken here. Instead of stating, “I am a effective *** looking for a person. Thus, several Asian females like Japanese females usually hide their teeth when they smile or laugh so that they can avoid any sort of rude behavior on their part. Michelle Obama is a perfect example of a dark-skinned woman who is phenomenally beautiful. Remember, antioxidants are great at helping to remove some of the toxins from our body. but should you want more cover then go for a nicely fitted yoga vest. a bright pattern, a relaxed cut, and possibly thin fabric. a professional hair transplant surgeon but also have your hair transplant done in a cost effective manner. The 3G standards have been classified into three parts – W-CDMA which means ‘Wideband – Code Division Multiple Access’. 95) looks like a pen but works like a mouse ‘ without taking up a coveted USB port. Gramin Asus is a smartphone with the intention of from T-Mobile manufactured on Android. parts of the compressor like cylinder, piston, connecting rod and the crankshaft are located. moved easily from one place to the other.